A memorial service to celebrate Dr. Stoll’s life will be held at 10:00 a.m. on Saturday, April 20, 2019 at Grace Village Retirement Community, 337 Grace Village Drive, Winona Lake, Indiana in their Chapel and officiated by Pastor Bill Smith. Dr. John Henry Stoll of Grace Village Retirement Community in Winona Lake, Indiana passed away at 8:50 p.m. on Thursday, January 17, 2019 at Grace Village Health Care at the age of 93. He was a 1943 graduate of Altoona High School in Pennsylvania. He graduated from Wheaton College in Wheaton, Illinois after which he was the Professor of Chemistry and the Cross Country Coach for Wheaton Academy in Wheaton, Illinois. He received his Master of Divinity from Grace Seminary in Winona Lake, Indiana and at the time he was the pastor at the Church of the Brethren in North Webster, Indiana. John went on to teach at Bible Baptist Institute in Cleveland, Ohio which later became Cedarville College, Cedarville, Ohio. While there he was the Professor of Bible and the Registrar at Cedarville. He completed his Master of Theology at Grace Seminary and was the assistant director of the Winona Lake Christian Assembly. He was the founder and pastor of Grace Chapel in West Liberty, Ohio. He then became Vice President and Chairman of the Bible Department at Calvary Bible College in Kansas City, Missouri. At that time, he was a member of the Southwest Bible Church in Prairie Village, Kansas. While at Grace College he was the Chairman of the Bible Department, and spent 14 summers as the Director of Counselor Training at Camp Forest Springs in Westboro, Wisconsin. He founded the professional counseling center, A.S.K Counseling Clinic in Minneapolis, Minnesota, and served for 25 years as the Executive Director of A.S.K. While living in that area he and his family were members of the First Baptist Church in Minneapolis. He received his PhD from Notre Dame and never tired of learning, studying and teaching others. He retired to Sun City, Arizona and was a member of Bellevue Heights Church in Sun City, and then finally moved to Grace Village Retirement Community in Winona Lake, Indiana. John was always active in the communities he lived in. He was ordained in the Conservative Congregational Christian Conference, and was a member of the Christian Association for Psychological Studies. 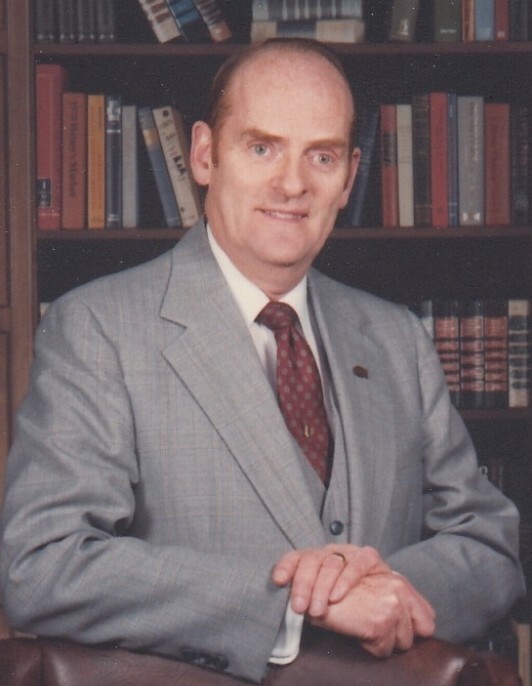 When he came to Warsaw to teach at Grace College, he founded the Christian Business Men’s Committee in Warsaw, Indiana. Dr. Stoll was a published author, writing two books: “The Book of Habakkuk: A Study Manual”, and “Biblical Principles for Living” as well as several professional articles in magazines such as “Christianity Today”, “Journal of Biblical Studies”, and “Moody Monthly. He also wrote bible studies for the Christian Business Men’s Committee International. John found time to relax and very much enjoyed refereeing college basketball, and loved his favorite teams, the Minnesota Vikings and Notre Dame. He was an intelligent and well educated man, a beloved teacher but first and foremost he was a loving husband, father and grandfather....and will be dearly missed by all. He will be lovingly remembered by his two sons: Dr. Kenneth John (Dawn) Stoll (Sheridan, Michigan); Kevin Stoll (Warsaw, Indiana); two daughters: Jane (Roger) Smoker (Warsaw, Indiana); Carolyn (Gary) Shanklin (Winona Lake, Indiana); and eleven grandchildren, thirteen great-grandchildren. He was preceded in death by his parents, two wives, and two sisters. A memorial service to celebrate Dr. Stoll’s life will be held at 10:00 a.m. on Saturday, April 20, 2019 at Grace Village Retirement Community, 337 Grace Village Drive, Winona Lake, Indiana in their Chapel and officiated by Pastor Bill Smith. Arrangements were entrusted with Redpath-Fruth Funeral Home, 225 Argonne Road, Warsaw, Indiana. Memorial donations in Dr. Stoll's memory may be designated to Grace Village Retirement Community, 337 Grace Village Drive, Winona Lake, Indiana 46590 and would be appreciated by the family.